On Friday 27th May 2011, the Science Gallery welcome Baba Brinkman, a Canadian born comedian / rapper / scientist / lecturer, with his unique "Rap Guide to Evolution". 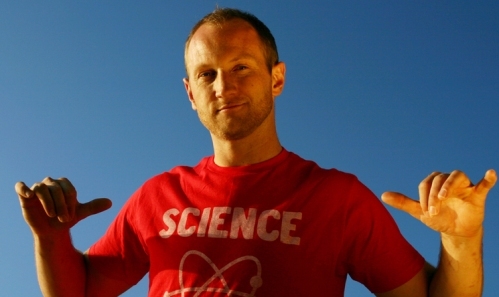 Brinkman's distinction style of science communication blends humour and hip hop to help explore scientific principles. The Rap Guide to Evolution is a hip hop exploration of modern evolutionary biology, originally written for Charles Darwin's Bicentenary and premiering at the Edinburgh Fringe Festival in 2009, where it won the Scotsman Fringe First Award for Innovation and Outstanding New Writing. It consists of 16 brilliantly constructed performances which not only entertain but also educate. To find out more about or to buy tickets for this exciting and unique event visit the Science Gallery website. Baba Brickman's Rap Guide to Evolution is also available on iTunes. The video below is entitled Performance, Feedback, Revision and is taken from the Rap Guide to Evolution show, as performed in the Hammersmith Apollo.